One of America’s favorite spokes figure is gearing up for the holiday season by introducing a series of holiday outfits. 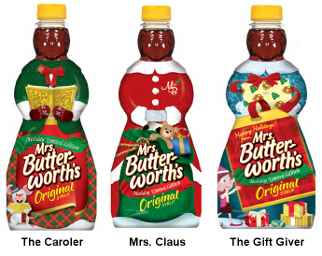 These limited edition holiday bottles are a part of the 2010 decorative series and is the first time Mrs. Butterworth will change out of her classic everyday dress. The new packaging features colorful full body shrink labels, themed for the holidays. The series consists of 3 different designs each with their own unique names: The Caroler, Mrs. Claus, and The Gift Giver. They are available in the 24 oz. size and in the original flavor. The company is promoting these holiday bottles as collectibles, hoping consumers will want to collect all three. They are counting on the draw of Mrs. Butterworth’s nostalgic presence for those who remember her from their childhood. They encourage consumers to have fun with collecting these limited edition bottles. The goal is to get family and friends involved in the search for this holiday packaging, hoping this will be a fun and exciting challenge for everyone. Keep your eyes peeled for Mrs. Butterworth’s holiday packaging in a store near you and be on the look out for more limited edition bottles appearing on shelves in 2011!